In order to become an enrolled agent (EA) and enjoy such benefits as certified tax expertise, a federal designation, increased income, and more job opportunities, you must pass the Enrolled Agent exam (officially known as the Special Enrollment Exam (SEE)). To help you prepare to pass, I’ll show you the Enrolled Agent exam syllabus. I’ll also discuss the topics covered by each IRS SEE exam part. If you are a tax preparer who would like the opportunity to represent your clients before the IRS, you can benefit from becoming an enrolled agent. Additionally, you can use the IRS EA designation to improve your marketability, differentiate yourself from other tax return preparers, and become more knowledgeable about taxes and tax laws. The testing window during which the EA exam is available runs from May 1-February 28 (29 in a leap year). All questions relate to the prior calendar year. The IRS updates the SEE exam during the months of March and April. Then, the IRS introduces a new version of the exam each May. The IRS bases the new version on the most recent tax law through December 31 of the previous year. 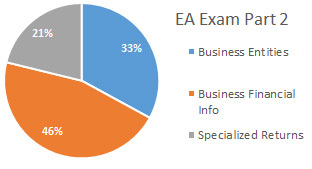 The EA exam requirements do not include an education or experience requirement. Rather, to take the SEE exam, you simply must have a Preparer Tax Identification Number (PTIN). You can take the IRS exams in any order. The IRS exam syllabus reveals which topics the exam addresses. The IRS syllabus also specifies how many questions the exam allots to each topic. To ensure that the IRS SEE Exam always covers appropriate topics, the Candidate Bulletin explains that Prometric periodically reviews the subjects tested. This review involves surveying the enrolled agent community and IRS subject matter experts. Prometric completed their most recent review in 2016. Each part of the Enrolled Agent exam contains 100 multiple-choice questions (MCQs). These 100 MCQs include 85 scored questions and 15 experimental questions. The IRS weights the 85 scored questions equally. Furthermore, the IRS does not score the 15 experimental questions. Rather, the IRS includes these questions in order to test their suitability for future exams. The experimental questions spread throughout the exam, and you will not be able to identify them as such. Therefore, you must answer all of the EA exam questions to the best of your ability. All of the Enrolled Agent exam questions provide 4 options from which you must choose your answer. You must always choose the one answer option that is the best. The Candidate Bulletin explains a scenario in which you would select the best answer to a SEE exam question. The example question asks about the Form 1040 filing deadline. In this instance, the answer to the question should be April 16 because the normal filing deadline fell on a holiday. If the answer April 16 isn’t available, but the option April 15 is, then April 15 is the single best answer. April 15 is generally the filing deadline, so you should select that answer option. Equally important is the fact that the IRS uses 3 different MCQ formats for the Enrolled Agent exam questions. This MCQ simply contains one sentence that asks a question. Which of the following entities are required to file Form 709, United States Gift Tax Return? This question type provides a sentence or two of information and ends with an incomplete sentence. The answer completes the sentence. travel reimbursements paid at the Federal Government per diem rate. This format makes a statement and then asks for the answer option that does not meet the criteria of the statement. There are five tests which must be met for you to claim an exemption for a dependent. Which of the following is not a requirement? Total testing time for each part is 3.5 hours. However, your total time at the Prometric testing center will be 4 hours, as your appointment includes 30 minutes for a pre-exam tutorial and a post-exam customer satisfaction survey. You should arrive at the testing center at least 30 minutes before your scheduled appointment time. An on-screen timer shows the time you have remaining for the exam. The EA exam does not include any breaks. You may leave the testing room to drink water or use the restroom, but the exam timer will not stop. 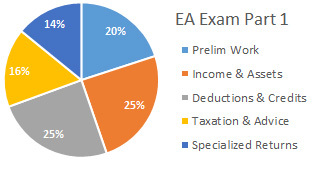 Because EA exam Part 1 focuses on individual taxation, it is relatively straightforward. For this reason, most EA candidates start with this part. However, Part 1 pass rates have dropped in the last couple of years, going from 72% to 61%. This pass rate decrease could indicate that many recent candidates didn’t prepare as well for this exam part as candidates of the past did, as Part 1 had a reputation for being easier. While Part 1’s pass rates are the lowest Enrolled Agent exam pass rates, they are still very encouraging for EA candidates. Corporate taxation, in particular, is more complex than individual taxation. Consequently, EA candidates usually consider Part 2 to be more difficult than Part 1. 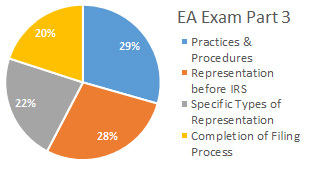 Although, the pass rates of EA exam Part 2 have increased and surpassed those of Part 1 in the past few years. Part 2’s pass rates jumped from 57% in 2015-2016 to 65% in 2017-2018. As Part 2 had a reputation for being harder, candidates who sat for this part more recently may have prepared better than their counterparts who came before them. Similarly, the candidates who pass Part 2 are usually candidates who passed Part 1, so they have experience with the exam that can help them increase the Part 2 pass rates. Finally, most candidates start with Part 1, and when some of them fail, they cease their pursuit of the EA designation. As a result, fewer candidates sit for Part 2. A basic knowledge in accounting is helpful for passing Part 2. You should also spend more time on practice questions for this part. Ultimately, EA exam Part 3 seems to be the easiest for most candidates. The Part 3 pass rate has hovered between 82-88% in the last 3 years. 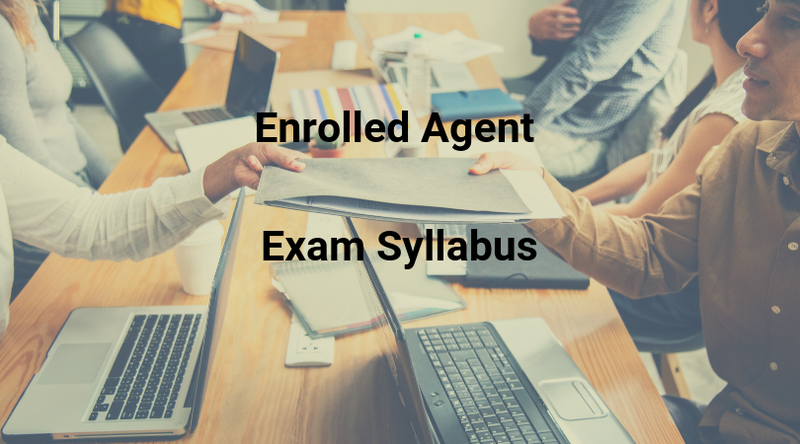 Now that you know all about the syllabus and structure of the IRS Special Enrollment Examination, you may want to discover the Enrolled Agent exam dates. You should also learn about EA exam scoring. But, most importantly, you should find an enrolled agent course to help you learn the content of the SEE. Your EA course will also provide you with enrolled agent exam sample questions. Additionally, all our favorite EA review courses include unlimited enrolled agent practice exams. Do you have any questions about becoming an EA? Then drop us a line so we can try to help! Or, get the answers to many common EA exam FAQs from our Enrolled Agent Blog.